Organizers of Saturday’s Dupont CircleWorld Cup viewing are trying to reserve the space for the finals in July. Paul Sotoudeh, president of the Screaming Eagles, a fan group for the D.C. United, said he anticipated the thousands who turned out for the U.S. vs. England match. He did not, though, expect so many to show up for Saturday’s earlier game with Argentina and Nigeria. So now he’s hoping to push forward and reserve Dupont Circle for the finals. With the first round under his belt, the finals could be easier. "There have been plenty of little hitches, but that’s the whole point of organizing, you take care of the hitches," he said. But will the finals, most likey not including the U.S., be a big enough draw to make it worthwhile if he does get permission to show it in the circle? Don't underestimate D.C.'s soccer fanatics. 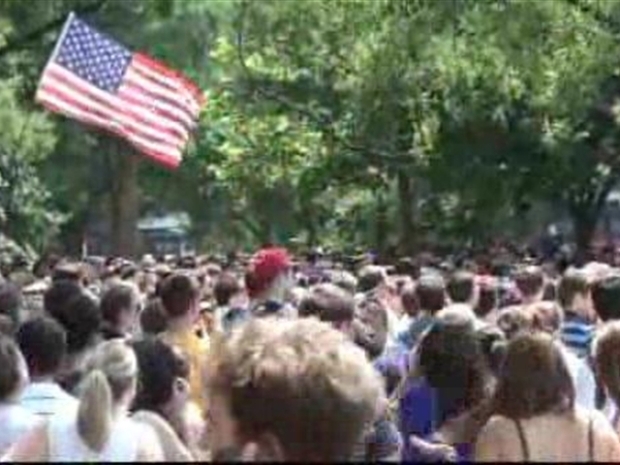 A busy Dupont Circle celebrated the World Cup and the Gay Pride Parade.